There’s a lesson in this clash of titans for all involved in leadership and the struggle to stay ahead of disruption. 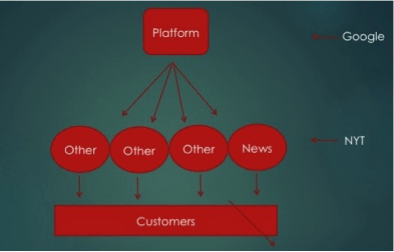 Google’s starting point is to operate a platform, then distribute other’s content. The NYT’s (and most other publishers’) starting point is to produce content. They are both competing for the same customers. The difficulty for companies like the NYT, in all kinds of sectors, is they are starting from a much more challenging and narrow position. It mightn’t seem so profound now, but this is the dilemma created by disruptive innovation. Google answers the above question better. So does old money like the NYT move up a level to give its platform wider appeal, or does it stay a news content producer. Increasingly we customers are relying on monster global platforms including Google, Apple, and others, for news and information. It’s only a matter of time before Facebook, Twitter and other channels (or whatever comes after them) invade that space too. To NYT’s credit, it is very innovative, constantly trying new ideas to respond. “Don’t choose between using digital technologies as a way to improve existing operations or using digital as a platform for new growth. Rather, use digital both to optimize today and to create tomorrow (underlines are mine). Sketch out blueprints of the ideal business model for both, based on the job the customer needs to get done, not on your current set of capabilities. Develop an honest capabilities balance sheet, highlighting both strengths and weaknesses, and compare it to your blueprinted business models. Some assets, like a brand, might make sense to use across A and B. Others, like sales representatives, might need to be duplicated. Historical strengths, like content creation, might need to be radically reconfigured or shared across organizations only with a great deal of care. New strengths, such as data analytics, might need to be built or acquired. Previous PostSocial media: Facebook's battle for eye-balls? Next PostIn Crisis PR, Apologies are Overrated.